Here are a few pictures taken at "The Cross." We spent some time out there enjoying the nice weather on Friday afternoon after we picked Chad up from EfM training. The kids love to see The Cross and look down into the valley. 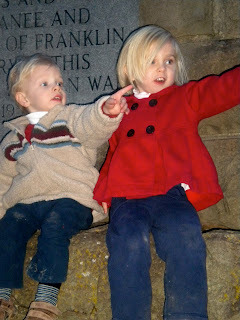 They really liked getting out of the car and climbing around the steps at the base of The Cross. This is definitely Sewanee landmark! HA! "Marguerite" is Susie Clark Lovelady....Sorry for the confusion!